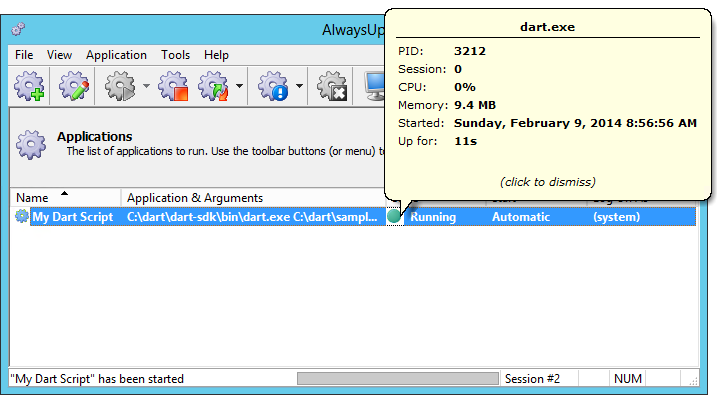 If you don't have Dart installed, download the Dart zip file and extract it to a folder of your choice. 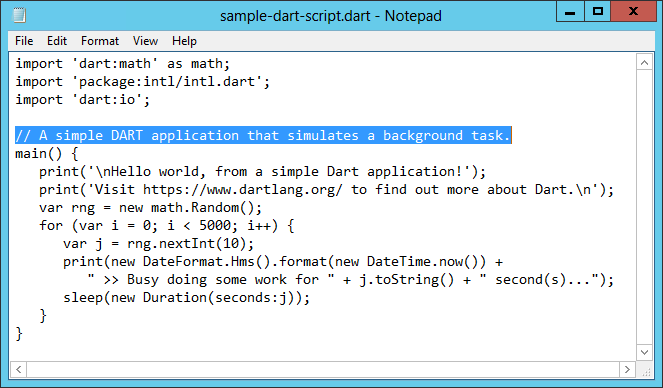 We have placed Dart in C:\dart and we'll reference that location throughout this tutorial. Next, let's ensure that your Dart script can run normally from the command line. In the window that appears, type the full path to the Dart executable (dart.exe) followed by the full path to the script you wish to run as a windows service. Be sure to quote each component containing at least one space! Hit the Enter key to execute the command line. If your script doesn't work as expected please resolve the issues now. If your script doesn't run here then it won't run as a windows service with AlwaysUp! 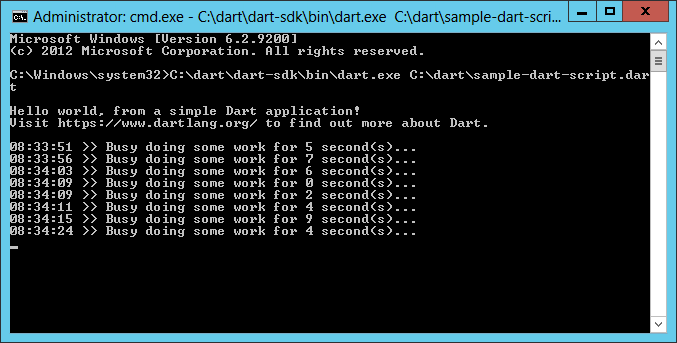 In the Application field, enter the full path to the Dart executable (dart.exe). 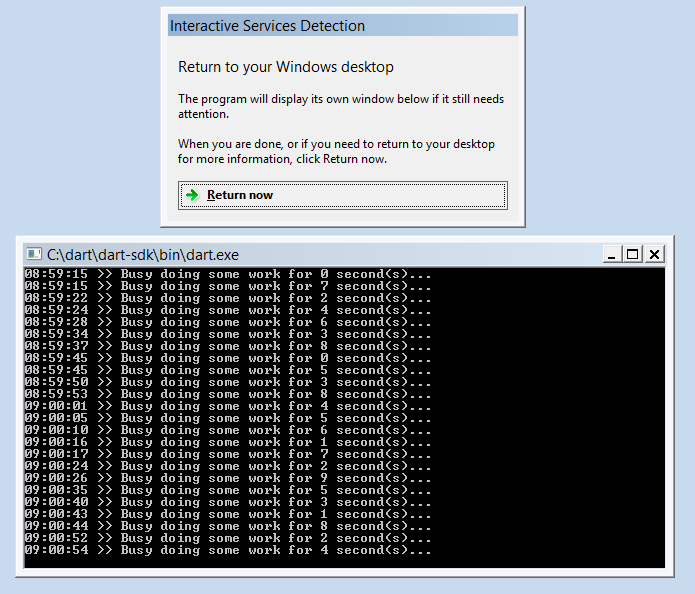 Again, as in step 3b, this is C:\dart\dart-sdk\bin\dart.exe for our installation. In the Arguments field, enter the full path to your Dart script. We want to run our sample script, C:\dart\sample-dart-script.dart. In the Name field, enter the name that you will call this application in AlwaysUp. We have used My Dart Script but you can specify virtually anything you like. If you want your script to run periodically (that is, not 24/7), click over to the Restart tab and choose when to run. For example, if you wish to kick off the script at 9 AM every day, check the Not immediately and At boxes and enter that time in the corresponding field. However we'll stick with the default of restarting immediately to keep our Dart script running all the time. Click the Save >> button. 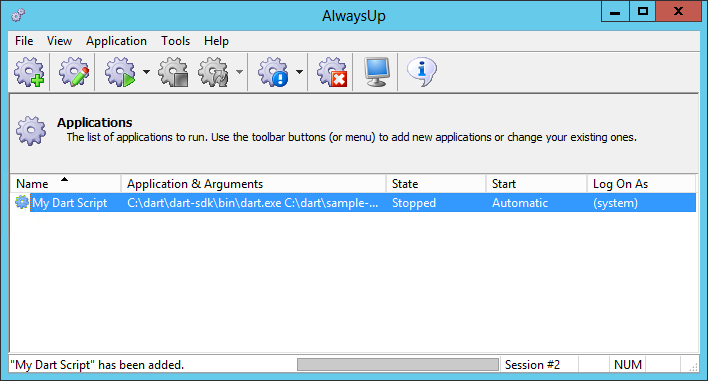 In a couple of seconds, an application called My Dart Script will show up in the AlwaysUp window. It is not yet running though (the state will be Stopped). 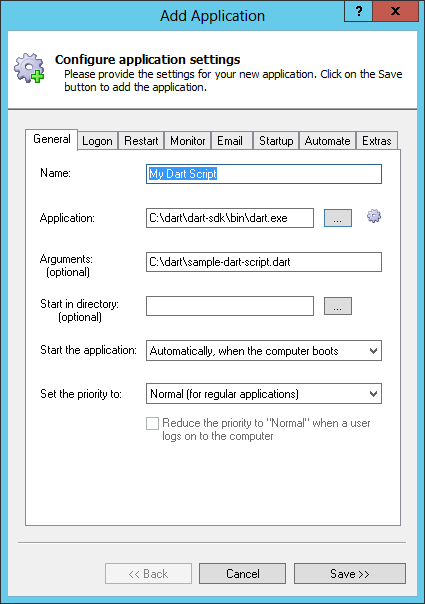 To start the service, which will kick off the Dart script, choose Application > Start "My Dart Script". In a few seconds, the state should transition to Running and clicking on the green circle will reveal a few details of the running process. 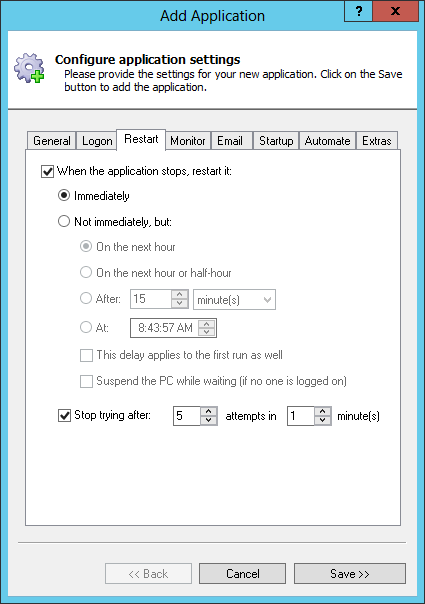 If you wish to hide that command window (and prevent the annoying notifications from the "Interactive Services Detection" window), edit your application in AlwaysUp, switch over to the Logon tab and check the When a user logs on, don't show the application's windows... box at the bottom. That's it! Next time your computer boots, your Dart application be launched immediately, before anyone logs on. We encourage you to explore the many other AlwaysUp settings that may be appropriate for your environment. For example, boost priority, run periodically and much more. Dart script not working properly as a Windows Service? Some Dart scripts need to be run in a user account to have access to their settings and resources. 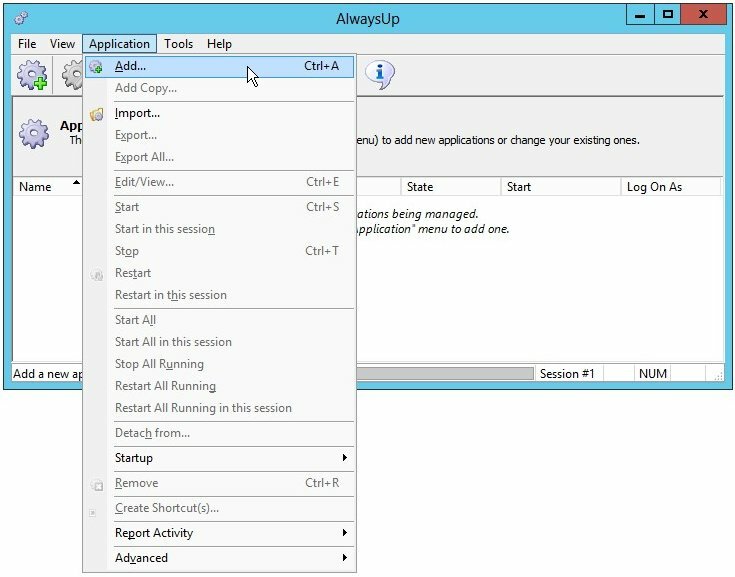 In that situation, edit your application in AlwaysUp, switch to the Logon tab and enter the user name and password of the account where you can run your Dart script normally (the one you were logged in to for step 3).